Working for the Missouri Health Equity Collaborative (MOHEC) allowed me to help develop and brand programs like Talk it OUT with your Doc, which focuses on LGBT health literacy and competency from the patient side. It empowered those who attended the meetings to learn to speak for themselves, seek help when required, and know the paths they use to get them the best health care. We partnered with PROMO Missouri and SAGE Metro St. Louis to bring these interactive courses to the St. Louis area in 2014. Topics included patients’ rights, power of attorney, finding and establishing a primary care physician, how to questions in a feedback method, getting access to health care, insurance, rights of having your family visit you and defining said family, and more. Approximately 55 people attended one or all of the sessions. I created the name, brand, and logo of the project and worked closely with other staff members and our partners to develop the programs and their content. I also helped present a portion of the program to approximately 60 University of Missouri Healthcare providers during a grand rounds. This included working with Joan Lipkin of That Uppity Theatre in St. Louis and her play “Are You Married,” which depicts a scene from a doctor’s office as a nurse interacts with a lesbian patient who is unsure of if she should mention her partner. MOHEC is a project of the Center for Health Policy at the School of Medicine at the University of Missouri and seeks to improve the health of all Missourians. 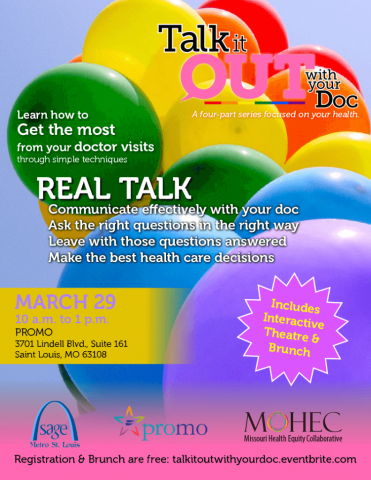 PROMO, SAGE Metro St. Louis, and Missouri Health Equity Collaboration are joining forces to bring Talk it OUT with your Doc to St. Louis. The goal of this four-session workshop is to raise awareness within the LGBT communities about health disparities and the need to establish regular and routine care with a doctor by providing relevant information coupled with tools, resources, and techniques that can aid participants in being better advocates for their health care needs. The first session is Jan. 18, 10 a.m. to 12: 30 p.m., at the PROMO offices (Coronado Building, Spring Avenue entrance), 3701 Lindell Boulevard, St. Louis, MO 63108. Unsure of when or if being LGBT matters to your health care? Want to learn more about your rights and responsibilities as a patient? Think primary care, routine screenings, and insurance don’t matter? 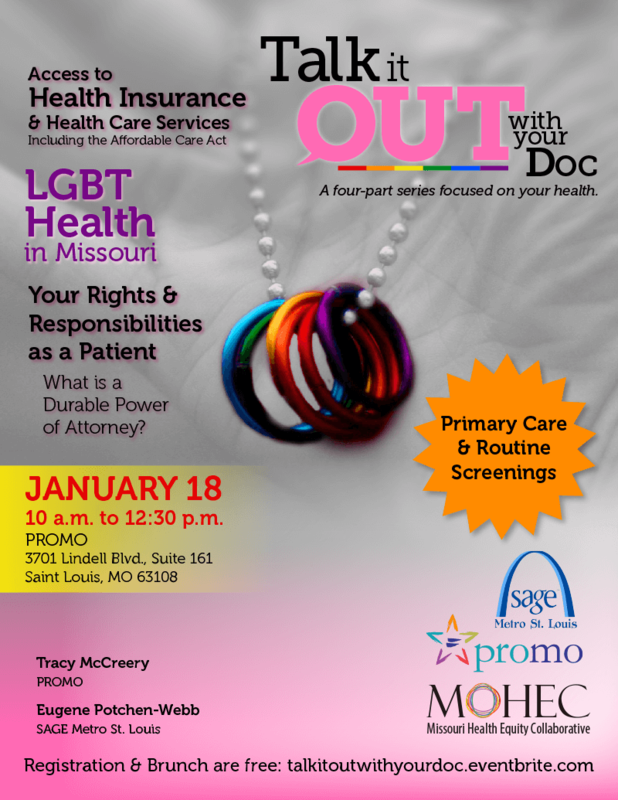 Join PROMO, Sage Metro St. Louis, and the Missouri Health Equity Collaborative (MOHEC) for a FREE four-part series focused on your health. 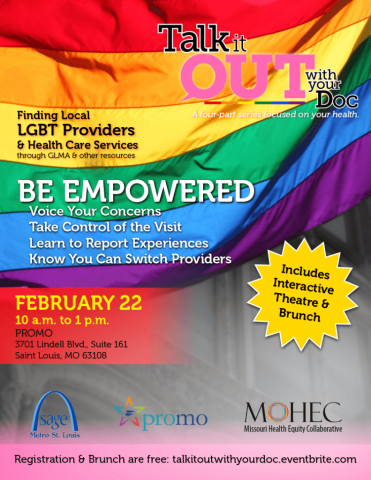 We’ll provide a safe space (and brunch) to discuss practical information and solutions for the LGBT community. You don’t want to miss OUT. The event is free, but we are asking people to register. (We promise it’s painless!) http://www.eventbrite.com/e/talk-it-out-with-your-doc-tickets-9347110459. See more Health Communication work.